The bridge at Rowsley spans the Derwent to the north west of that river's confluence with the Wye, close to the Peacock Hotel. The Derwent Bridge was built when people crossed the river on foot, or travelled on horses or donkeys, and the single lane bridge was unsuitable for post First World War traffic and motorised vehicles. Their circles finished in a glassy flood." 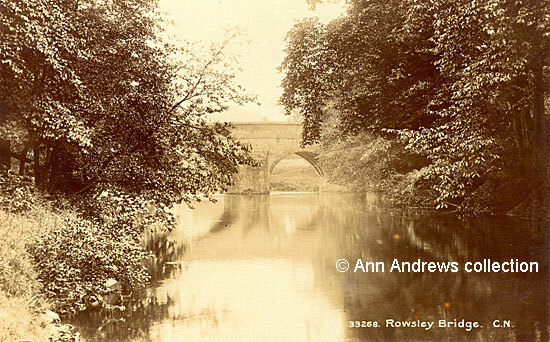 Rowsley Bridge was already problematic at the beginning of the twentieth century. In 1900 the County Council's Bridges and Highways Committee reported that they were taking steps to replace the roadway over the bridge and the work would cost £100. The state of the bridge was discussed again in 1912 in a report from the same Committee. The roadway was then in very bad repair, and a considerable amount of work was needed to put things right. At the time the road was paved with gritstone setts, and the Committee had been advised of the necessity of completely re-paving the bridge, substituting the gritstone with granite setts and with a concrete foundation instead. It was also suggested was that the only way for the work to be carried out was to close the bridge to heavy traffic during the day and then completely closed between 10p.m. and 8 a.m. for the majority of the work to be carried out during the night. This drawing dates from about 1907. By 1924 there was a great deal of discussion and dissent about what to do. The County Council had put forward a proposal to demolish the historic bridge and build a new and larger structure, but the idea faced considerable opposition. The North Darley Urban District Council then passed a resolution recommending the county authority retain the bridge and widen it. It was described as a "beautiful old structure" by the Council's chairman, Mr J. Wall, and the resolution was a good compromise. In the spring of 1925 agreement was reached with the Marquis of Granby that included the payment to his lordship of £350 for part of the Peacock Hotel garden, whilst £250 was to be paid as compensation. Nikolaus Pevsner wrote that the early 17th century bridge was widened from 16 feet to 40. We can see how narrow the original structure was on two superb Harry Gill photographs in Michael Fay's article "The End of a Long and Winding Road". Thomas Tudor visited the Derwent Bridge when it was being widened. He pointed out that, unlike other bridges such as Bakewell, Cromford or Duffield, there was no open access to any ground from which its full merits could be seen. The railway line had been constructed on the north eastern side of the river in the 1840s and the Rowsley to Buxton extension, begun in 1860, was opened in 1863 but you can't see it in either of the images here. The extension passed over the road A6 close to the north eastern end of the Derwent bridge. The line was dismantled in the 1970s as part of the Beeching cuts. He added that the five bold Gothic arches on the lower side were to be saved and there would be rounded arches on the newer section. In October 1925 the abutment on the western side of the bridge had been completed up to springing level, and the work of the abutment on the eastern side and the river piers was proceeding. The rebuilding work was eventually completed in the summer of 1926, after 12 months work. In the first week of July the bridge was tested with ton weights and was found to be quite within the standard required. The following year a new tarmacadam surface was laid over the bridge; the Derby Daily Telegraph cautioned that care was necessary! There are two documents that mention Rowsley in the Wolley Manuscripts, Matlock, Vol.6666 - ff.147-9 and 6666 ff.250-5. 1. 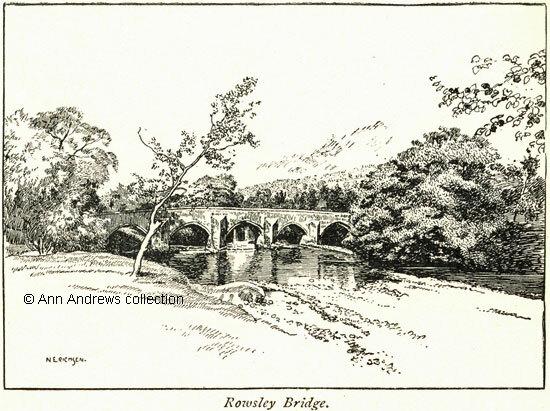 "Rowsley Bridge", Published by C. N., No.33268. Unused. No publication date. 2. "Rowsley Bridge", an illustration by Miss Nellie Erichson published in Firth, J. B. (1908) "Highways and Byways in Derbyshire", MacMillan & Co., London. Firth, J. B. (1908) "Highways and Byways in Derbyshire", MacMillan & Co., London. "Derbyshire Times and Chesterfield Herald", 14 July 1900. "Derby Daily Telegraph", 10 July 1912. "Derby Daily Telegraph", 29 February 1924. "Derby Daily Telegraph", 15 April 1925. Thomas Linthwaite Tudor (1926), "The High Peak to Sherwood, The hills and dales of old Mercia", published London by Robert Scott. "Derbyshire Advertiser and Journal", 9 October 1925. "Derby Daily Telegraph", 1 July 1926. "Derbyshire Advertiser and Journal", 9 July 1926. "Derby Daily Telegraph", 25 February 1927.